1. 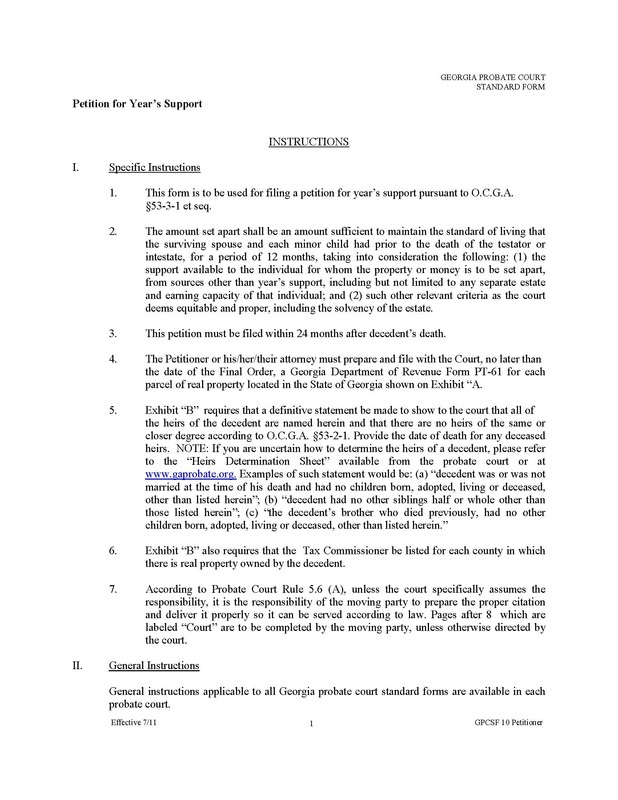 This form is to be used for filing a petition for year’s support pursuant to O.C.G.A. 2. The amount set apart shall be an amount sufficient to maintain the standard of living that the surviving spouse and each minor child had prior to the death of the testator or intestate, for a period of 12 months, taking into consideration the following: (1) the support available to the individual for whom the property or money is to be set apart, from sources other than year’s support, including but not limited to any separate estate and earning capacity of that individual; and (2) such other relevant criteria as the court deems equitable and proper, including the solvency of the estate. 3. This petition must be filed within 24 months after decedent’s death. the date of the Final Order, a Georgia Department of Revenue Form PT-61 for each parcel of real property located in the State of Georgia shown on Exhibit "A.
the heirs of the decedent are named herein and that there are no heirs of the same or closer degree according to O.C.G.A. §53-2-1. Provide the date of death for any deceased heirs. NOTE: If you are uncertain how to determine the heirs of a decedent, please refer to the "Heirs Determination Sheet" available from the probate court or at www.gaprobate.org. Examples of such statement would be: (a) "decedent was or was not married at the time of his death and had no children born, adopted, living or deceased, other than listed herein"; (b) "decedent had no other siblings half or whole other than those listed herein"; (c) "the decedent’s brother who died previously, had no other children born, adopted, living or deceased, other than listed herein." 6. Exhibit "B" also requires that the Tax Commissioner be listed for each county in which there is real property owned by the decedent. 7. According to Probate Court Rule 5.6 (A), unless the court specifically assumes the responsibility, it is the responsibility of the moving party to prepare the proper citation and deliver it properly so it can be served according to law. Pages after 8 which are labeled "Court" are to be completed by the moving party, unless otherwise directed by the court.